Have you ever wondered what people from the 1920s would think if they saw our modern day cars? Have you ever gone a step further and wondered what our cars will look like ten, twenty or fifty years from now? I guess that you imagined that we would all be cruising in flying cars that hover six foot from the ground. Well, we aren’t quite there yet. But technology has really advanced in the last few decades. With car technology evolving at a rapid rate it might be difficult to picture. Cars are vastly different from the machines of a few decades ago – faster, more spacious, and more intelligent. This infographic from Car Loan 4U, a company that offers free advice for new and used car finance, explores what cars might look like ten years from now and what developments will make them even better than the models we have today. We are already seeing the introduction of computers into cars to help avoid crashes, but over the next few years we will see cars taking on more autonomy, understanding driver behaviour and reacting safely. It is hoped that cars will one day become “crashless”, which could have all sorts of implications for lower insurance, fewer repairs and generally safer roads. Over time we will also see cars become a lot lighter and more fuel efficient, and also a range of more eco-friendly fuel options enter the mass market. 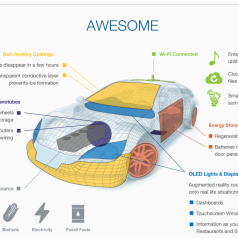 Take a look at the infographic below to get an idea of what the ultimate car of the future will look like.